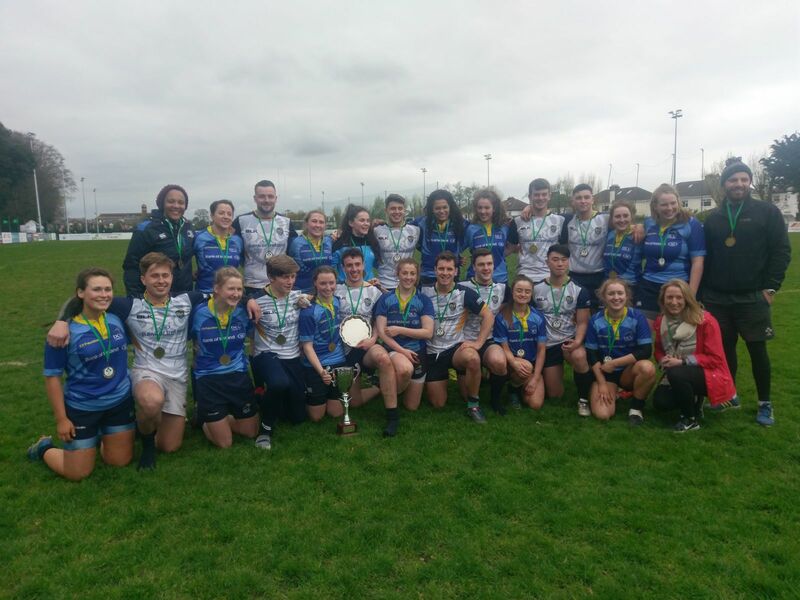 Last week saw a double header of success for DCU as both the Men’s and Women’s Rugby Sevens teams concluded the year with some stellar performances, and silverware, in Terenure. Both teams went into the competition as reigning champions in their respective divisions with high expectations resting on their shoulders. DCU Men’s got of to a flying start as they swept past Ulster University, with Peter Wright putting on the finishing touches in a fine team performance. Adam Swan put his own unique stamp on the tournament early on with an impressive piece of individual brilliance leading to a try. DCU started their next game in the same manor, scoring 4 tries early on to burst into a commanding lead against Belfast Metropolitan College. However, complacency crept in allowing Belfast Met to end the game within touching distance. This pattern followed in the final group game against the Institute of Technology, Tralee, where DCU again were forced to defend their lines during the last few moments of the game. Eventually DCU turned over possession and sealed their passage through the group stages unbeaten, booking a place in the semi-final with Ulster University at Coleraine. In a manner that reflected their earlier form in the tournament, DCU burst into life early on with four tries before half time. After the break, Yuta Mishina appeared to put the game to rest with what many believed to be the final blow to UUC. However, UUC fought back with four tries late on to claim a place in the final, sending DCU to a game with Belfast Met for the shield. DCU were adamant not to make complacency an issue against Belfast Met and again came out strong at the start with tries from Mark Gerrity, Peter Wright, Cillian Walsh, and Adam Swan giving DCU a commanding lead before the break. At the restart, DCU showed great resolve and composure to finish the day with a dominating performance and take home the shield. Despite the win, Ollie Hamilton maintained the team was “disappointed not to make the final”. “We tend to switch off and there was that refereeing decision against UUC, but I’m proud of the lads who showed a lot of character in the shield to not switch off,” said Hamilton. He also sees a silver lining for last years winners; a new found thirst for increased success. “It’s a great opportunity,” he says as he sets his sights on reclaiming the title from Athlone IT. In the Women’s tournament, DCU defeated a strong University of Limerick side in the final to finish the 5-team tournament as champions. The Sophie Spence coached side rounded off a successful day for the DCU Force.